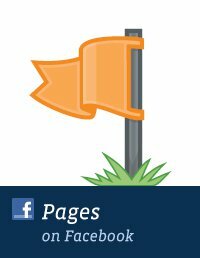 Digital marketing expert Sandi Krakowski, founder of A Real Change International, took to the Facebook for Business page to share five tips for businesses looking to launch Facebook pages. Begin with research: Before you even launch your page, do a little research and get inspired by other pages already out there. Find some pages on Facebook that would be similar to yours and study what they’re doing. And pay attention to what very big brands are doing in your niche, since that will give you your first clue in terms of what you should be posting on your page. Learn as you go: Don’t be afraid to just get started — Facebook walks you through the steps and provides additional help resources so you don’t have to have every little detail set up perfectly. Just get going and learn as you go. I’d also say don’t be alarmed if you pick the wrong page category. You’re not going to be penalized, and Facebook makes it easy for you to change it. Over time, you can go back with a fine-tooth comb and perfect these little areas. Getting started and learning how the page works is really the important thing. Think about your “about” section: In your about section, your company overview should be very simple. Make it similar to the about page on your website. It’s also important to understand some keywords that should go into your description so that you’re easy to find. Of course, always put your phone number and your website address. It’s really just a matter of putting your existing business information on your page. Put your best face forward: Small business owners should always remember that people do business with people, they don’t do business with brands. I have found, from the small business owners that I’ve worked with, that if they put a picture on their page — whether it’s of the team or a key figure that the audience would connect with — engagement often goes way up. People connect with people way before they connect with a brand. And if you have something that you’re really interested in your customers seeing, post that as a photo on your page’s Timeline. Understand your goals: For me, loving our customers is not a marketing thing. It’s truly about having a relationship with them. But that relationship is going to be different for each business. For a restaurant or a lawyer or the owner of a retail store, their business is the products or services they provide. Each business needs to understand its goals, find its own way to reach their customers, and then use Facebook to have a relationship with their customers that will help them achieve those goals. We would like to wish our American friends a very happy 4th of July. Although we can’t bring you fireworks per se, we are hoping that this week’s content will add a little sparkle to your Facebook marketing campaigns. We hope you ‘like’ it! Marketing people love the famous saying – we know that half of advertising works, but we can’t tell you which half. Once you have a Facebook advertising campaign up and running knowing what to do next can be difficult. How do you know which ads are working? Find out how to performance manage your campaigns in this article. What’s the PULSE on This? Partner Categories is one of the powerful ad targeting tools that Facebook has made available in recent times. The trouble is that it’s not available to advertisers outside the US. That puts you at a distinct disadvantage if you want to target US consumers but are based overseas. Find out how to work around the problem. This now means that if you are travelling from the US abroad you can still advertise using Partner Categories and if you are based outside the states using a VPN will give you access to Partner Categories to target US consumers. The inability to edit Facebook ads has long been a bugbear of advertisers. Small typos meant starting again from scratch. Find out how you can edit your ad text, thumbnail image, headline and link description. Doing so does come with a word of caution though – read on…. Many advertisers have been complaining that they don’t have the ability to edit ads once set-up. Most don’t realise that they can do exactly that. Jon recommends that you only make edits to ads in the early stages of creation and not long after an ad has been running so that you don’t skew your reporting data. It is not advisable to use this feature to split test ads. If an ad is not performing you are better to create a new advert with new copy and imagery. Facebook has made an announcement on what advertisers can expect from the new look Sidebar Ads. Find out what’s in store with the roll out of this update. Facebook have started to roll out bigger Sidebar Ads and this change is sure to give advertisers an opportunity to get better engagement on those ads. With increased competition and more targeting options advertisers should expect a decrease in the overall number of impressions but an increase in the quality of those impressions. Facebook has launched new versions of the Pages Manager App on Android and iOS. Find out what changes are in the pipeline. A client recently said to me “We are an established business, carrying “top of the range” products, 50 Likes doesn’t look good! We could buy some to make it look better.” Don’t, PLEASE DON’T! I searched and it looks like you can buy 1000 UK (or so the say!) Likes for around £69.99, and it will take a week to complete. Now here’s the part where you have to ask yourself about your social media strategy. I have a Facebook page so I can learn about my customers, their interests, passions, and their opinions on services I provide. From this, I can learn from my customers, do I need to adjust, add or drop services. How do i do this? I ask! So I have 1000 new Likes on my page, I ask a question – I get the same amount of replies as i had before my new likes appeared. So that means, i’m no better off having those new likes. 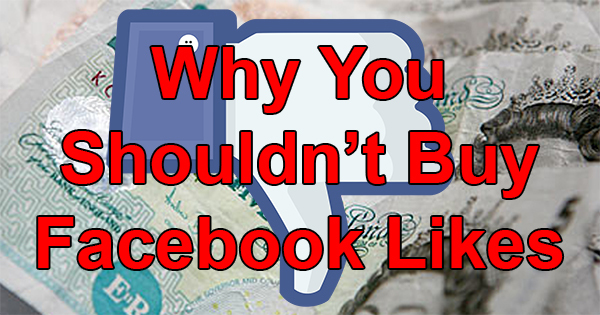 (Why you shouldn’t buy Facebook Likes). I post a link to my website and track the clicks – no new traffic, no new sales, no better off. (Why you shouldn’t buy Facebook Likes). So, 7000 fans cost (Going by above price) £489.93 if you made that your yearly budget to gather real likes from real people using Facebook adverts, you would spend less than £9.50 per week, but here’s the thing – you would be connecting with real people, leading to real statistics – which improves the relationships between you and your customers leading to improved profits and a better business. BUY Facebook advertising before you buy Facebook Likes. Tell us if you tried buying Facebook likes and how that worked out for you. If you enjoyed this post, please leave a comment below. I don’t know about you, but I like to change my Facebook cover picture on a regular basis. Are you the same? It’s such a fantastic piece of Facebook real estate that can be put to great use, and it shows in your fans timelines each time you change it. The dimensions of your cover picture are 851px X 315px. Each time I change it though I like to fit in a new piece of information about my business on it, a new service, product, a call to action or just my contact details. Here are some clever ideas that you can implement into your cover pictures. Leave a comment to tell me how do you use your Facebook Cover Pictures? Show us some love….Share it? Kieran on Should I advertise on Yell? Ryan on Should I advertise on Yell? Jannette on How do I create a simple Facebook Marketing Plan?